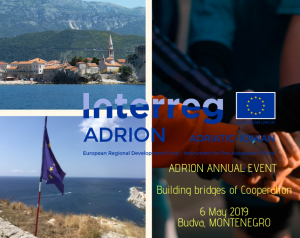 The 2nd edition of the ADRION Annual Event organised under the headline of Building Bridges of Cooperation in the Adriatic and Ionian Region will take place on 6th May 2019 at Hotel Splendid in Budva, Montenegro, back-to-back with the 4th EUSAIR Annual Forum under the auspices of the Programme’s Montenegrin Presidency. The meeting will start at 10 AM on 6th with the welcome speeches of our host institutions followed by three discussion panels involving ADRION project representatives in the field of transport, Blue growth and sustainable tourism. The second part of the event will be dedicated to the launch of our 3rd Call for Proposals. The participants will be introduced more in details to the four topics of the call by expert’s keynotes and ADRION Joint Secretariat. Please note that registration is now open until 26 April 2019, in order to register please enter the EUSAIR website and fill out the registration form following this link. We hope to have you all on board! KEYS TO EFFECTIVE COMMUNICATION – SAVE THE DATE! The Adrion Programme organises “Keys to Effective Communication“, a workshop for communications officers to ADRION funded projects with the aim of helping projects use communication to contribute to the project objectives and expected results, integrate communication into the project life cycle and informing target audiences in a clear and effective way. 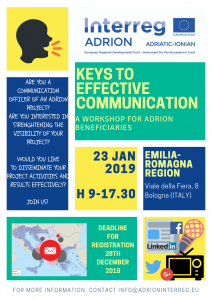 The workshop will take place on 23rd January 2019 at Regione Emilia Romagna Premises. The event is open by invitation only. Interreg ADRION projects play an important role in sharing ideas and new solutions in several sectors across the eight ADRION Partner States. In order to be successful, projects are required to communicate their activities and results to a wide range of audiences via different media as well as during public events. Having a clear communication strategy and well-developed communication toolkits are key if you want a project to stand out among many others. At the event, participants will learn how to develop clear project messages, headline and proof points that they can use to tell their project story to different audiences as well as how to make the most of the main communication tools. If you are responsible for the communication activities within an ADRION funded project, come on board! For more information contact us at info@interregadrion.eu. http://www.adrioninterreg.eu/wp-content/uploads/2018/11/ADRION-COMMUNICATIONS-SEMINAR_OK_ok.png 1123 794 Adrion /wp-content/uploads/2017/03/logo-adrion-new.png Adrion2018-11-30 14:03:492018-12-04 17:52:35KEYS TO EFFECTIVE COMMUNICATION - SAVE THE DATE!